1To the chief Musician upon Mahalath, Maschil, A Psalm of David. thou hast put them to shame, because God hath despised them. 6Oh that the salvation of Israel were come out of Zion! When God bringeth back the captivity of his people, Jacob shall rejoice, and Israel shall be glad. adders' poison is under their lips. who have purposed to overthrow my goings. they have set gins for me. 7O GOD the Lord, the strength of my salvation, thou hast covered my head in the day of battle. 9As for the head of those that compass me about, let the mischief of their own lips cover them. 1Then we turned, and went up the way to Bashan: and Og the king of Bashan came out against us, he and all his people, to battle at Edrei.2And the LORD said unto me, Fear him not: for I will deliver him, and all his people, and his land, into thy hand; and thou shalt do unto him as thou didst unto Sihon king of the Amorites, which dwelt at Heshbon.3So the LORD our God delivered into our hands Og also, the king of Bashan, and all his people: and we smote him until none was left to him remaining.4And we took all his cities at that time, there was not a city which we took not from them, threescore cities, all the region of Argob, the kingdom of Og in Bashan.5All these cities were fenced with high walls, gates, and bars; beside unwalled towns a great many.6And we utterly destroyed them, as we did unto Sihon king of Heshbon, utterly destroying the men, women, and children, of every city.7But all the cattle, and the spoil of the cities, we took for a prey to ourselves.8And we took at that time out of the hand of the two kings of the Amorites the land that was on this side Jordan, from the river of Arnon unto mount Hermon;9(Which Hermon the Sidonians call Sirion; and the Amorites call it Shenir;)10All the cities of the plain, and all Gilead, and all Bashan, unto Salchah and Edrei, cities of the kingdom of Og in Bashan.11For only Og king of Bashan remained of the remnant of giants; behold, his bedstead was a bedstead of iron; is it not in Rabbath of the children of Ammon? nine cubits was the length thereof, and four cubits the breadth of it, after the cubit of a man. 21But now the righteousness of God without the law is manifested, being witnessed by the law and the prophets;22Even the righteousness of God which is by faith of Jesus Christ unto all and upon all them that believe: for there is no difference:23For all have sinned, and come short of the glory of God;24Being justified freely by his grace through the redemption that is in Christ Jesus:25Whom God hath set forth to be a propitiation through faith in his blood, to declare his righteousness for the remission of sins that are past, through the forbearance of God;26To declare, I say, at this time his righteousness: that he might be just, and the justifier of him which believeth in Jesus.27Where is boasting then? It is excluded. By what law? of works? Nay: but by the law of faith.28Therefore we conclude that a man is justified by faith without the deeds of the law.29Is he the God of the Jews only? is he not also of the Gentiles? Yes, of the Gentiles also:30Seeing it is one God, which shall justify the circumcision by faith, and uncircumcision through faith.31Do we then make void the law through faith? God forbid: yea, we establish the law. 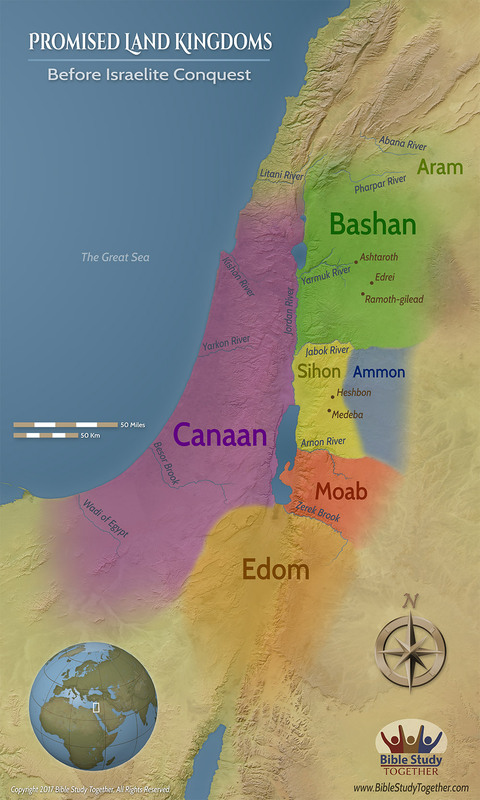 What is unique about Og King of Bashan? How does the law and Prophets illustrate the righteousness that comes by faith? Why can’t people boast about being right with God? How have you fallen short of the glory of God? Support someone who is being spiritually attacked.